I have Michael to thank for this incredible trilogy to make it into our classroom. This year seems to have been all about the dystopian youth novel and this trilogy does not disappoint The story is action packed, easy to read, and the author James Dashner ends every chapter with a cliffhanger. While this story is also for more mature readers because of its violence, I had a hard time stopping once I started, unfazed by the length of the books. The trilogy has an original story, and it is wrapped up nicely in the end. I was truly sad to finish the final book and hope many of my students will enjoy it as well aslong as their parents approve. This book contains violence but is rated for 6th grade and up. Math – We finished unit 6 with flying colors and started unit 7 yesterday. So far the test is scheduled for February 12th before the CRT. Students continue to improve in their math facts, which show in their math work. We will be relying heavily on our common sense this unit as we start to discuss positive and negative integers, as well as expanded notation. Science – Students had their flip stick Olympics and we start the test tomorrow. The first go through will be with no notes, then I correct it, and students then get to go through it again with their notes. We will start landforms and do our bubble gum research paper in the next couple of weeks. Social Studies – Students were introduced to Prezi this week as we start our 13 colonies project. Students will have a couple of weeks to research their colony and place all of their information into a 3-5 minute long Prezi presentation. We are also busy doing Mystery Skype with another one scheduled today; I also had an article published about Mystery Skype in “Learning & Leading” magazine. Reading – We did our very first speed book recommendations, which the students seemed to enjoy immensely. We have also discussed point of view and I am having informal reading conferences with many students. I am also sending home another book order today simply because it is had the sequel to the False Prince for order. For many students this is the must read book at the moment. The book order will be due Feb. 1st or next Friday. Writing – Writing has been a great deal of fun as students continue drafting their fiction stories. We will continue to edit our stories and hopefully get them wrapped up and published within the next two weeks. I cannot wait for them to share their stories. * Doodle for Google is back with the theme this year being The Best Day. This annual contest is one the kids look forward to! The grand prize winner will get a $30,000 scholarship, their school will receive a $50,000 scholarship and their Doodle will be featured on Google’s homepage for a day. Students were given contest rules last week and have until March 15th to submit to me, their submissions do require parent signatures so be aware of that. * The Carnival is coming; Thea and I will be there for sure on February 16th as this is one of our favorite events that happen at West Middleton. * The sledding party was a brilliant success. Thank you to those who donated items to make the party a success. I loved how the students came together and just had a lot of fun; they deserved it. * What a week for the kids in the room; Graham took second in the district spelling bee as well as first in the WM geo bee. 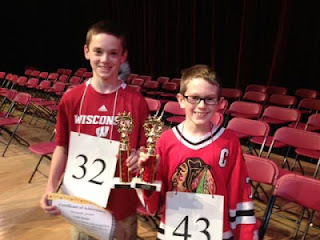 Noah E took 16th in the district spelling bee and 2nd in the geo bee, Buddy took 27th in the district spelling bee and his poem has been selected as a finalist in the Yahara River Writers Contest. Joining him as finalists are Cece, Ethan and Noah E. What talent! * Middle school election slips go home today to be returned ASAP to me. Your child can choose between band, chorus, orchestra, or 5-day PE. * I have some dates for you to put on your calendars: No school Monday, January 28th, WM PTO meeting Thursday, January 24th 7 PM, Book orders due Friday February 1st, Special surprise January 30th 1 PM, Read-In Party all day except for specials Friday February 1st, Early Release February 12th, Valentine’s Day Party 1:30 PM February 14th, Carnival February 16th. Not only were there 3 of our kids in the district spelling bee, they also all got really far! Congratulations to Buddy, Noah E and Graham. Way to go all three of you! Graham ended up battling it out with his brother and got an amazing second place in the district. He now moves on to the county spelling bee held in Stoughton on February 14th. Who can go the shortest? After 45 minutes of competition a clear winner stood out; Team England with 17 points. Congratulations Amber, Viv, Alicia and Megan! What are the cold weather guidelines when school is in session? When the air temperature is 0 degrees Fahrenheit or colder and/or the wind child factor is -10 degrees Fahrenheit or colder, all students shall be permitted to enter the building upon arrival to school, and will be kept indoors during recess periods in grades K-8. Just some random pictures from our latest round of Mystery Skype, these kids are knocking my socks off. It is time to sign up for spring conferences, which will be held March 7th and 12th. Please click the button below to sign up for the time that works for you. Just remember; your child MUST be present for the conference. We will discuss progress as well as middle school readiness and transition. We are starting a different spelling routine this week using the Words Their Way program. I will model how to do these new routines throughout the week and next week students will be doing in on their own with my help. Their spelling notebooks with their work will be due to me every Friday morning. The spelling test will be 10 randomly selected words every Friday during resource time. Monday Morning: Word Sort with your group or alone. Read the words from your sheet. Sort all of the words into categories. Write each spelling category in a different column in your notebook. Copy your spelling words in the appropriate columns in your notebook. At the bottom of the sheet, explain what you learned about the words during this sort. Choose 4 of your spelling words. For each word, make a connection to four NEW words (that are NOT your spelling words) based on sound, spelling pattern, etc. The connection can be about beginning sounds, ending sounds, how many syllables, short vowels, long vowels, or words that rhyme with your spelling word. See the sheets in this packet for examples of good connections you can make with spelling patterns! Staple the sheet to your notebook. All work should be in your spelling notebook. Write five sentences using at least 1 spelling word per sentence. Underline your spelling word in each sentence. Make these sentences good quality! Write a short story using at least 5 of your spelling words. Underline your spelling words in the story. Make this story at least five sentences long. 2. Tell your buddy to read each word to you. As your buddy reads each word, write it down in your notebook – see template for how it should be set up. 5. For any words you misspelled on the first try, write them correctly (you can look at your word list) in the third column labeled “Correct Spelling”. Circle the parts of the word you need to remember. Write your scores at the bottom of each column. Math – We are getting through unit 6 with flying colors and the test has been moved to Friday January 18th. I like how the first part is heavily focused on working with data and then the second half is all about adding and subtracting fractions. To make fractions more tangible please point them out outside of school such as in cooking or shopping. Science – We flew our planes and tangled a few lines. We also evaluated each other science response, becoming reflective scientists, and now prepare for flipsticks. We started today with a brief free time exploration of them and then decided which variables we could change to effect the distance of the launched item. Our supertube challenge was a blast with students focused on their build for 45 minutes. The videos will soon be uploaded to our website. Social Studies – The focus has been main idea and details; learning the tricks for figuring out how to tell someone else the main idea. Today’s culminating activity was for the students to jigsaw a page or two, figure out the main idea and details and then present them in note form to the class. I was excited to hear the conversations taking place and the thoughtful approaches to discerning details from larger points. Reading – We are getting close to the end of Harry Potter and will then pick up “Wonder.” We have been heavily focused on setting weekly reading goals, conferring with me on plans of how to meet them, and focusing in on our independent reading. I have started assessments in class as well. Biblionasium has been a huge hit and I love seeing the students recommend books to each other, and to me. Writing – Our fiction writing unit has been a lot of fun so far and I am intrigued by the imagination of many of the students. We have focused on developing characters and setting up our story ideas. Next comes developing struggles and wants. * What a wonderful week of learning. I am thrilled every day with the way these students work together and how eager they are to explore. * Congratulations to Graham, Michael, and Noah E. for representing the class in the geo bee next week. * Our reading challenge is well under way and half of our bulletin board is filled with book covers. How many books we have read! We are hoping to reach our goal by January 30th, if we do a very special surprise awaits. * Thank you for party donations for the sledding party. While it is bit wet, the kids and I are all excited to get this community building time. * We have participated in 2 Mystery Skype’s this week, we did one with new Hampshire Wednesday and one with Wisconsin today. The questioning ability of the students has greatly improved with a laser-like focus on figuring out the state – way to go! * Snow shoeing is next week; if there is snow left, students must bring snow boots to participate. I will let you know when I know. * We got our tech tools that I was awarded in a grant; 3 Bloggie video cameras, 2 Canon Powershots, and a Livescribe pen. Students are becoming experts and then teaching each other about the tools. * The first map test; reading, will be this coming Thursday at 1 PM. * I have some dates for you to put on your calendars: MAPS testing January 17th and 24th, No school Monday, January 21st and Monday, January 28th, WM PTO meeting Thursday, January 24th 7 PM, Valentine’s Day Party 1:30 PM February 14th, Early Release February 12th. community that will encourage your child to read more. If you are a member of Goodreads, this is much the same. Kids can keep track of their favorite books, log their daily reading, and share recommendations with each other. I can also setup recommended and favorite books and add any kind of reading challenges we may come up with. Although you do not need to join as a parent, there is also a parent component and you and your child can access BilioNasium from home. As a parent you will then be able to see our classroom’s reading lists, monitor your child's independent reading and even set up family reading challenges. If you wish, you may also want to give your child permission to connect online with friends and classmates to see what others are reading, to read book reviews, and to receive and recommend books. Their username is the same as they use here in school and their password is the same as well. (Please email me if your child does not remember it). child and to our classroom. different, something new, and to see just how much they are reading. I am excited to provide this forum for the students to share their love of reading. I had heard from many teachers that The False Prince was one of those books I should make sure I read, and yet it sat in our classroom library for over a year tucked away in one of those bins. The January reading challenge though made me want to read it finally and I am so glad I did. I zipped through this book in two days because it is that good. Brandon even commented on how good it must be since I read it during breakfast at Hubbard Avenue Diner rather than speak to him, which was not very nice of me. There is some violence in it but not graphic and it fits in with the story of Sage and the other orphan boys. I feel completely comfortable placing it in my classroom library and have a feeling it will be a popular book.. The only drawback there is to this story is that the next one in the trilogy does not come out until March, but yes, i have already pre-ordered. I cannot wait to get this into the hands of the students. Students have been practicing expression and fluency in their reading, what better way to do it than through reader's theatre. The students have been working on fluency and expression; here is the final result. We finally got started on our super tube challenge with our planning stage today. Students are very excited to see who can build the strongest tube next week and I am too. Each student reported to me how many chapter books and picture books they will read in the month of January. I tallied them up and our classroom goal is 220 books! Whenever a student finishes a book they write it down on their reading log and also report it to me. I print out the cover and put it up on our "We Are Readers" bulletin board. I cannot wait to see it all filled up! Finally, if we meet or exceed our goal we will be having a special read in day where we do all reading all day in our sleeping bags. I cannot wait to see if we can meet our goal!